It's nothing new to see a tall tower sprout up and alter Surrey's skyline, but 2019 could be an unprecedented year for new highrises. Stephen Hallingham, a blogger for Urban Surrey, keeps track of new building proposals in the City Centre neighbourhood. "There's quite a few in the pipeline," he said. "I've tallied about 40 highrise projects that are either under construction or approved recently." Tien Sher has bought up a large swatch of property on King George Boulevard near 108 Avenue, which the developer plans to transform into the "Yaletown of Surrey." Two new residential towers near King George Station will soon be completed and the city's tallest building, 3 Civic Plaza near city hall, is now open. Hallingham says these projects are just the beginning of what's to come. 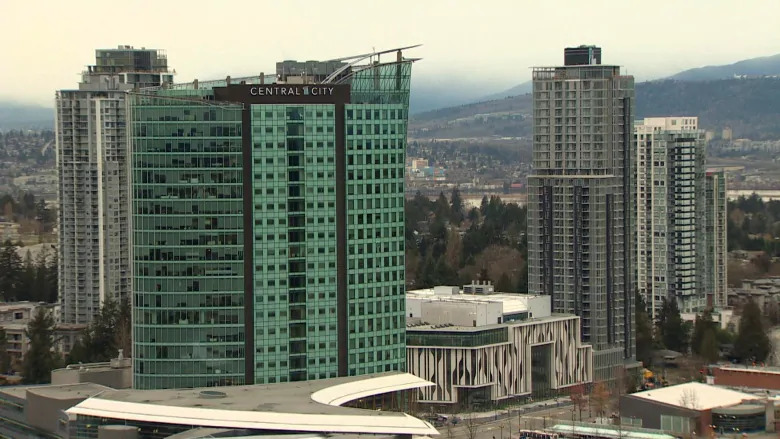 "You're really going to see Surrey City Centre take off in the next two to five years," he said. "Then, in the next 10 years, it's going to be remarkable, the transformation." The vast parking lots and strip malls that currently line the north end of King George Boulevard are gradually being replaced with skyscrapers. Anthem Properties recently purchased a large section of land on King George Boulevard near 102 Avenue, which is currently home to a Canadian Tire and Save on Foods. Vice president of development Rob Blackwell says over the next decade, Anthem will build eight buildings on the site that will feature retail space, townhomes and highrises. "It's huge," he said. "Just like the rest of Surrey in this area, it's growing." Blackwell says he's not concerned government efforts to cool Metro Vancouver's housing market will have an effect on sales. "We have faith in the market," he said. "We've been working on this project since 2015 and we like the fundamentals."